I read, take courses, and seek feedback from others in order to improve my craft. I reach out to other writers, educators, family, and friends for recommendations of works I might feature throughout my site. I read and take courses about how to best build a successful writing career based on what success looks like for me. Setting intentions for the new year feels great until all that “starting energy” fizzles out by the end of the month—if not sooner. A way that taps into your intuition to (re)define what success means to YOU? A way that allows your creative energy to zero in on the projects you really want and need to work on this year? A way to set intentions with an open heart, ready to receive the gifts and surprises the new year has to offer? If any of that sounds good, then this FREE 7-Day Challenge is for you! Through a series of daily writing prompts sent directly to your e-mail you'll kick off the year on the write foot (pun intended because I'm corny like that). BONUS: You'll also have access to a private Facebook group for extra support & camaraderie. 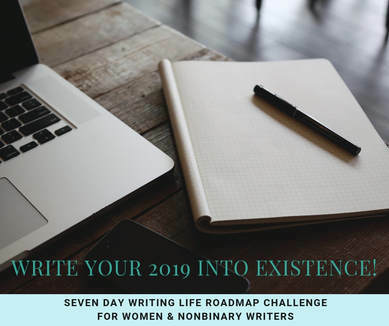 Let's Write Our 2019 into Existence Together!